If you’re not familiar with your tooth’s root canal, it is the space located under the tooth’s crown and below the gum line. Your tooth’s natural root is part of an important substructure that contains a pulp chamber, some dentin, nerves, blood vessels, and the periodontal membrane. If an infection becomes serious enough to reach the vulnerable pulp and root canal, root canal therapy becomes necessary to prevent extraction. When performing a typical root canal therapy procedure, our team will need to remove the tooth’s natural pulp and any harmful bacteria from within the canal and replace it with a safe, biocompatible substitute. 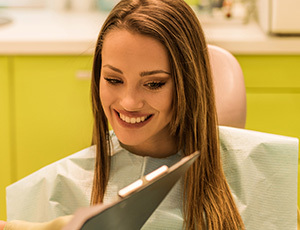 After thoroughly cleaning the tooth and sealing it to prevent further infection, a custom-made dental crown is typically recommended as the finishing touch. This will restore the tooth’s natural shape and ability to function. While it is possible to complete the root canal therapy procedure in one appointment, some cases can require multiple visits here at Premier Dental Care. Dr. Bakhtyari may recommend this service if tooth decay has reached the inner pulp or if a certain tooth has suffered extreme trauma. Our goal when performing root canal therapy is to rescue the tooth from the threat of extraction. Extracting natural teeth could lead to health problems for not only adjacent teeth, but your overall smile’s wellbeing. By leaving the natural tooth root safely in place, the surrounding teeth and tissue will be positively affected. This procedure is highly successful and often lasts for life, but some patients may need re-treatment in the future if harmful infections reoccur. Following treatment, Dr. Bakhtyari will always provide the patient with special care instructions. Make sure to continue brushing twice a day, flossing once a day, and attending checkups every six months. These routines will help preserve both your natural teeth and your dental restorations.